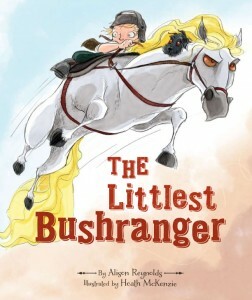 The Littlest Bushranger picture book is no shoot out at the high corral, no Ned Kelly re-enactment; this beautifully written story is a true-to-life, fast-paced drama as played out in the backyards and imaginations of children all over Australia and the world. 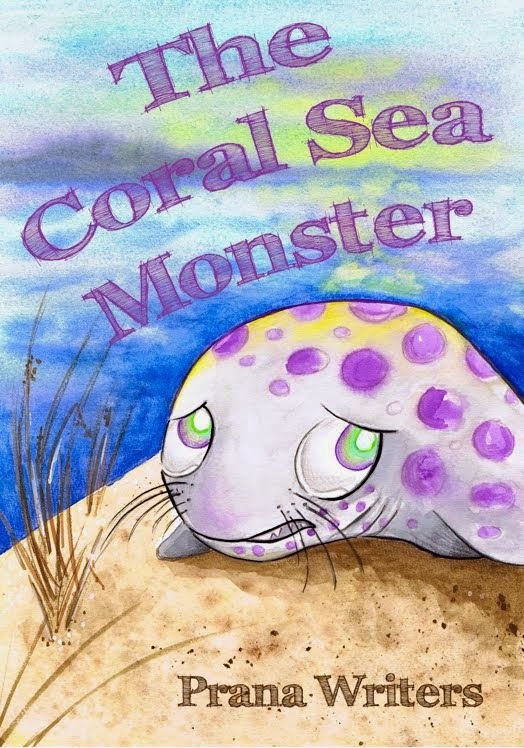 Author, Alison Reynolds, and illustrator, Heath McKenzie, have teamed up once again to produce a winner both in words and pictures. Now, I have to admit I have an ‘illustrator crush’ on Heath McKenzie. I follow him online wherever I can; it’s not stalking, right? If you’re a curious person like me, have a nosey at Heath’s illustrator studio via Tristan Bancks’ website. Or Heath’s interview here the last time he visited me for the blog tour last year of A Year with Marmalade, also by awesome author, Alison Reynolds. The good news today is that Heath is once more visiting Under the Apple Tree to answer more meaty questions about the illustrator process. Hi Heath! Welcome to my blog, Under the Apple Tree. Grab a spot on the picnic rug. Hi Angela, glad to be back. You must be very proud of how well The Littlest Bushranger has turned out. It's delightful! One of the first things I do when picking up a new picture book is to look at the end papers, front and back. 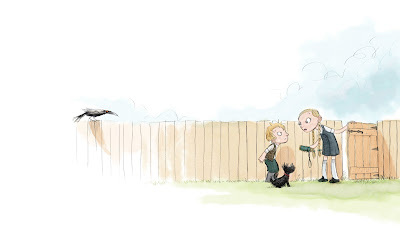 In The Littlest Bushranger I learnt the crow and the bicycle (both common to an Aussie backyard) are integral to the story. What were your thoughts when designing the endpapers? How do you choose what to include and what to leave out? Or the title page for that matter? Often, these things come fairly late, unless I have a decent idea of things earlier on. In this case it was open for discussion between myself and the editor, with the editor ultimately coming up with the idea and then between us we refined it to tell that little hint of story! The title page can be a similar situation - in this case the image used was actually an alternate cover concept that didn't make the cut - so it was great to see it find a use elsewhere in the book. Yes, the title page is so much quieter and contemplative than the pages to follow. For me the illustrations in The Littlest Bushranger are brimming with movement, varying perspectives and face-paced visual narrative. The beginning few pages set the scene and introduce the characters. As the dog, Hector’s distrustful eyes check out the crow and its long, menacing shadow, there is a hint at the drama about to unfold as the bicycle wheel bleeds off the page. Then suddenly it is game on! A heightened visual drama so strong I could only just keep up. The sudden, repeated changes in perspective and page-turning speed of the narrative fling the reader forward through the next six double page spreads. 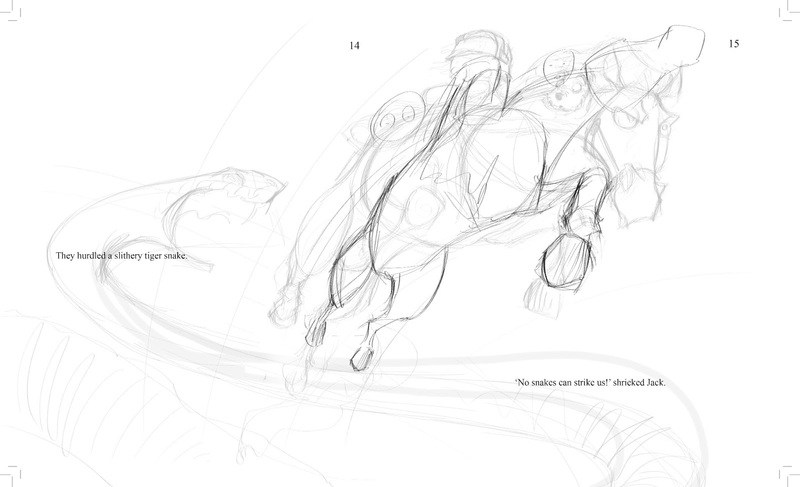 I am on the horse with Jack and Hector, bolting across the page from left to right. I am giddy with page-flowing suspense. Heath, you must’ve had a lot of fun illustrating those pages. Would you be able to share your process for one or more of the double page spreads with us together with your reasoning behind decisions on pace, perspective and movement? The outlaw was, in hindsight, a big setter of the pace, so to speak! Given it swoops in and then takes off, the imagery needed to follow suit. I wanted things to start out much looser and less saturated, colour-wise, even to the extent of the first spread sort of bleeding in from left to right, casually sort of trickling in in a lazy afternoon sort of way! 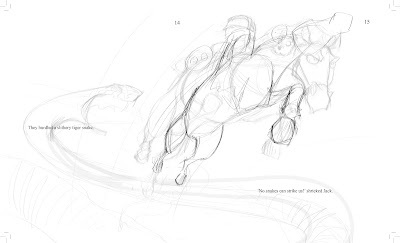 (illustration below) And then of course as the action and fantasy takes hold, particularly given Jack leapt onto a horse, the story needed to visually gallop along at a hefty pace as we give chase. Adventure was the key component to get across - and plenty of drama! Hence the dynamic angles used throughout the fantasy sequences. When you received this manuscript from the publisher, how did you approach your first read through? Were illustration notes attached from the publisher or author? Do ideas for images come straight away? How do you first begin to naturally decide on page breaks? There were loose illustration suggestions for certain things, but overall it was left wide open and the text itself was much the same - leaving it up to me to work out how best to portray things. The manuscript was provided in basic page breaks which is often the case, so that decision is made for me and gives parameters to work with, sometimes for the best, sometimes for the worse! Can you tell us about this example above of a rough for pages 14-15? It shows a change of perspective as well as how a layout page looked when I received it (to show the page break spreads I received and how little information I was given allowing me to figure out whatever I thought worked best!) plus I've provided it as the initial rough to really show the scribbly, messy decision making and desired action for that spread! That's so generous of you to share, Heath. Aspiring illustrators can learn so much from roughs that show the thought processes and multiple, overlaid sketches behind an illustration. Jack and his ‘gang’ are all so brave. Their steely determination is shown through their posturing and the fierce glare in their eyes. It’s a team effort to defeat the villain, “Good work, everyone.” Were Hector and the horse based on animals you know? The horse, I guess, was based on classic archetypes of the wild west hero on his white steed....which I designed prior to thinking about the bike, so the challenge became colouring the bike to suit what it would become without it looking either uninteresting or out of place in the real world. The dog is actually inspired by Tex, a little dog from Melbourne's 'Little Bookroom'! Thanks so much, Heath, for visiting today. Congratulations on The Littlest Bushranger’s release. Here, take some apple pie home for the family. There are a couple of monsters in The Littlest Bushranger. One's a bunyip and the other an outlaw/monster who steals Lil's telescop. What sort of monster do you like? Send along a painting/drawing/model of a monster and you could win a piece of Heath McKenzie's amazing artwork for The Littlest Bushranger. Upload your own best monster to Facebook https://www.facebook.com/alison.reynolds.524 or email it as a low res jpeg file to alrey@msn.com.au and we'll upload it. If you don't have a scanner, take a photo on a smart phone and email that. There are two categories - under 12 and 12 plus, including grown-ups. Entries close 25th June. Win a free pass to an adult non-fiction commissioning editor's desk. Just comment on this blog post or any other blog during the Littlest Bushranger book tour and add the initials NF. The more you comment, the more chances you have to win the draw. Watch out for other prizes along the ride. and copies of The Littlest Bushranger. Just comment on the posts. Thank you, Dimity! I ask the questions I want to know the answer to and hope everyone else does too. Thanks, Tania. I think I could talk picture book creation all day. Thanks Angela for hosting this leg of Alison's Blog Tour. You're welcome, Karen. 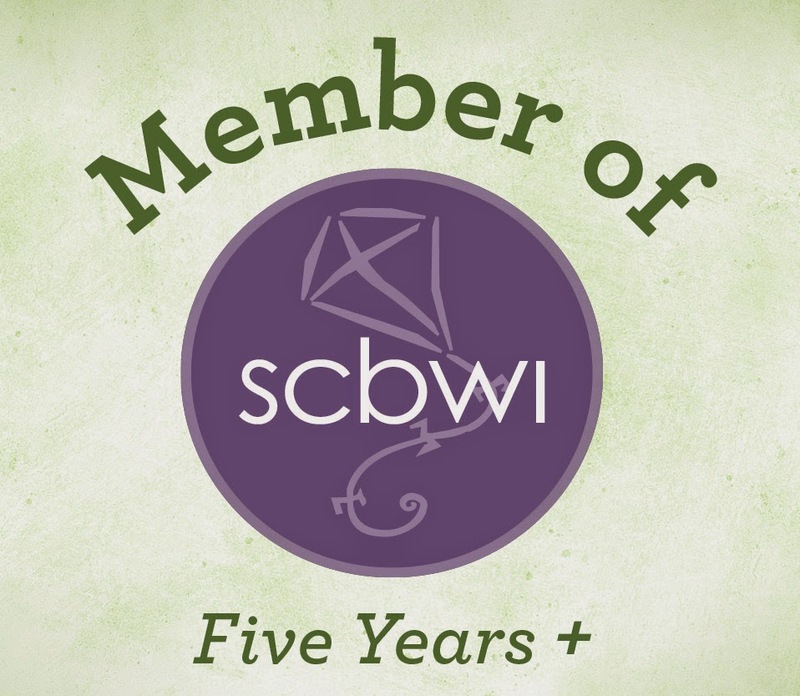 I hope that interviews like this one can broaden readers' and writers' understanding of picture book illustration and inspire other emerging illustrators. So interesting to hear how you do your amazing illustrations, Heath. Angela, I always love your probing questions - they always inspire great answers from the people you interview. Picture book creation is such a fascinating topic isn't it? I learned a great deal too from Angela's questions, Dimity. An illustrator really does look at things from a different POV and with Angela she can be both writer and illustrator, the lucky duck! And interesting to learn that Angela has a crush. You never know what you will find out! And doesn't Angela ask great questions. She could become a quiz person, but then she mightn't have time for her own fantastic books. It is fascinating learning how the illustrator can bring a book to life! This would have been a fascinating read anyway - but it followed on so well after the BusyBees observations on Day One. So lovely to have the artist to artist perspective. It is special to have the artist to artist perspective. It's fabulous from a non-illustrator's pov to see how illustrations are created, even down to the feel the illustrator is seeking to create. Loved reading all about it. Great questions and terrific explanations in answer. Thanks, Angela and Heath again for such insights. Yes, Alison. There are some illustrators I absolutely respect and admire, and Heath is one of them. I'm hoping that my (as you call it) artist to artist discussion fills a niche for those interested. Thanks Dee and Kat, I was inspired by the questions asked on Kat's blog post by the grade 1-2s. They were already pretty probing and I learnt a few things too! Hi Chris! Last year at a conference I met a picture book writer who was incensed that an illustrator might put their own 'spin' on his/her story, that they didn't follow or need concise illustrator notes, that they might add little subplots within their pictures, and that they shared royalties. 'No way!' she said. 'This is my book!' I was shocked and amazed that someone believed this. And so here is my blog to broaden understanding, I hope. Hi Kathy, Thank you for visiting. You may be interested in other illustrator interviews here on my blog. Look under 'Blog Tours'. Thanks for your wonderful questions, Angela and thank you Heath for sharing part of your process for creating the wonderful illustrations in The Littlest Bushranger. I love hearing about how authors and illustrators work together to create picture books. Obviously Alison and Heath are able to merge their creative perspectives well to achieve such a fantastic result. Very many thanks for hosting and your questions, Angela, and for your fascinating description of your process, Heath. I look forward to seeing a physical copy of this book. When a picture book is first taken from the shelf in a store, people always comment on the art first and say 'What wonderful pictures (or endpapers)', not 'What wonderful words' - but I know the words in this will be perfect. Hi Susan, You're absolutely right. 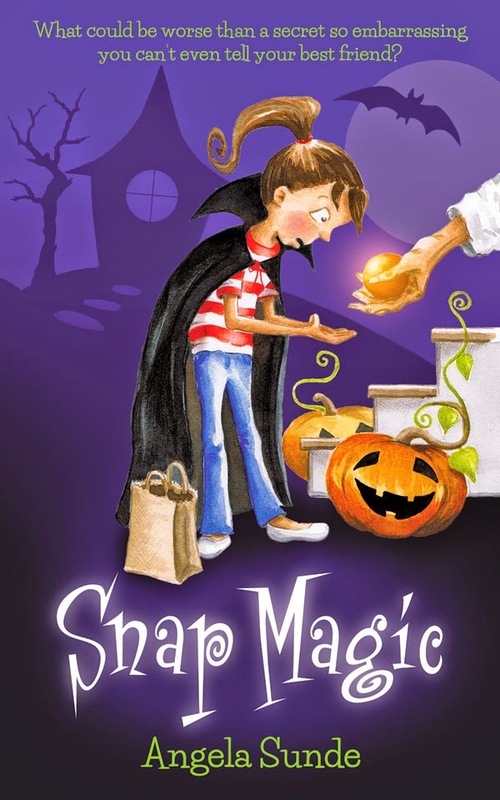 Experienced author, Alison Reynolds is talented at writing stories which offer opportunity for the illustrator to take the story to another level. Writers must be aware of leaving 'room' for the illustrations. This is a careful balance to achieve. Hi Peter, I'll see if I can bring my copy to the BIG meetup on Saturday. Thanks for dropping in. You and me both, Kelly. Heath and Alison constantly inspire me. I am absolutely thrilled to be hosting The Littlest Bushranger. I learned so much from this post! So fascinating to understand an illustrator's perspective. I feel so lucky to collaborate with Heath McKenzie, Susan. His illustrations have such zest! Peter, you are a true illustrator at heart to look at the endpapers first! I'm so happy to be hear in the apple orchard with Angela! Kelly, glad to hear you enjoyed the interview, and Angela thank you for asking such excellent questions. 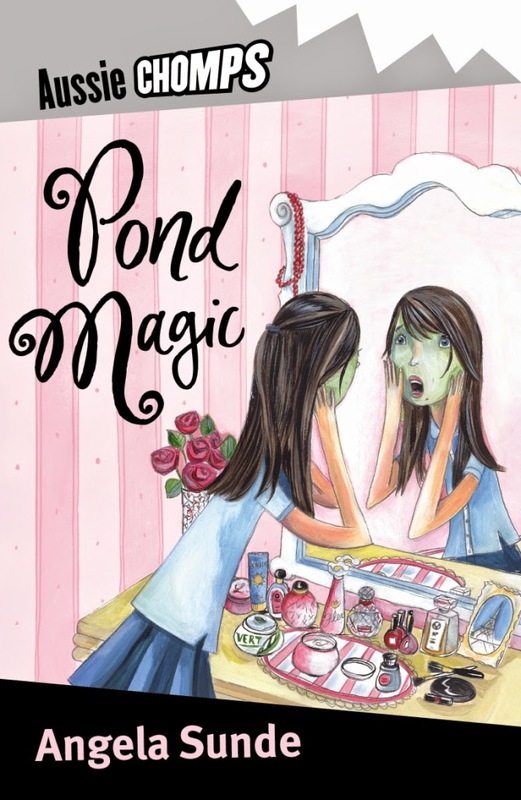 I am fascinated by the symbiotic relationship between author and illustrator. In a sense I guess this has to be the ultimate surrender; to take your work which you have toiled over for weeks, months maybe even years on end and entrust it in another, knowing even though you are done, alone it is not complete but requires another...I am intrigued by how in the end the illustrator adds a new dimension to it. One you probably did not even imagine in the writing and you find it good, nay it is GREAT. What a lesson. Thank you. nmn. The collaborative creation of a great picture book is an art form. Perhaps the only one that combines the senses of touch, sight and hearing mixed with imagination. So happy to hear that you've enjoyed the tour. Good luck in the competitions. I think Heath is a wonderful illustrator, Kaye. He and Angela gave us all (including me) a great insight into how Heath illustrated The Littlest Bushranger. Reading this interview after seeing the book is much more delightful. I have the same "crush". Thanks Angela. I just received this book and I can't tell you how smitten I am with it. This was a brilliant interview. Thank you. I thought I recognised the little dog.